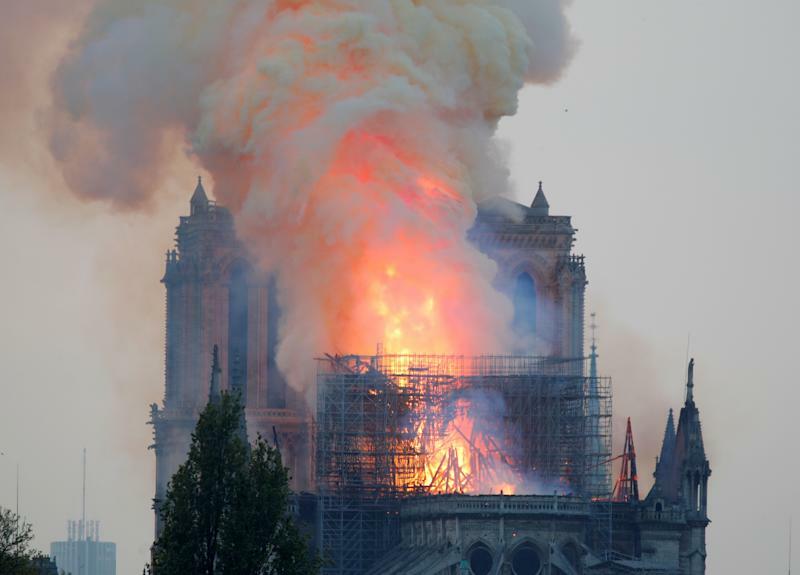 Pictures showing Notre Dame cathedral this morning have revealed the scale of destruction caused by the devastating blaze. 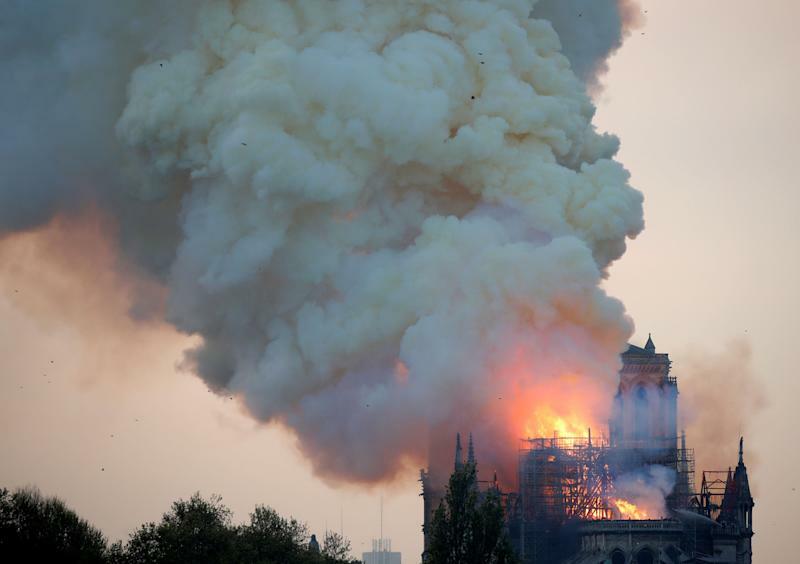 The catastrophic fire in Paris has left a nation mourning the destruction of its 850-year-old cultural and historic “epicentre” and sent shockwaves around the world. 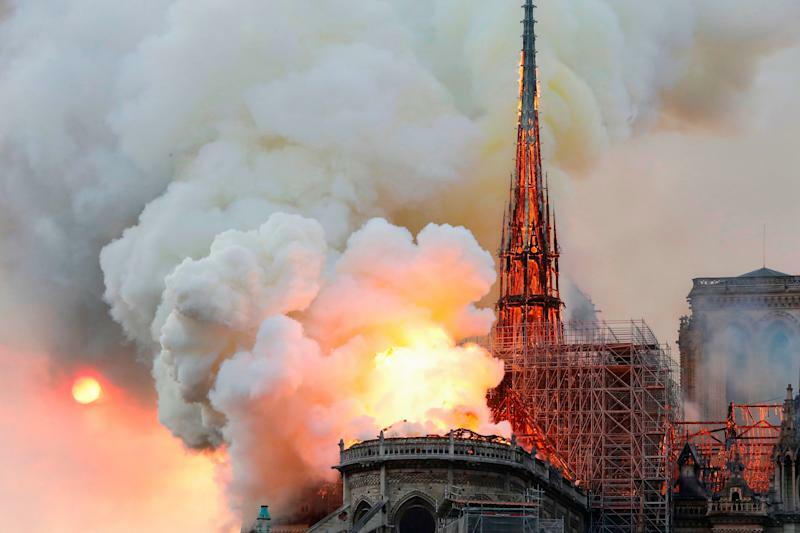 Hundreds of firefighters tackled the blaze through the night, battling to stop it wreaking complete destruction of the treasured facade after flames torched the roof, sending its spire crashing to the ground before crowds of horrified Parisians. 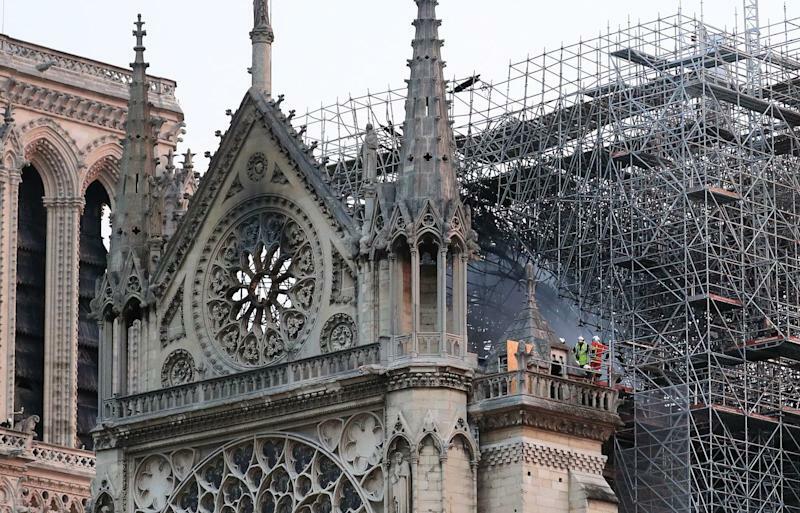 Fire damage was clearly visible in the cathedral's iconic building work. 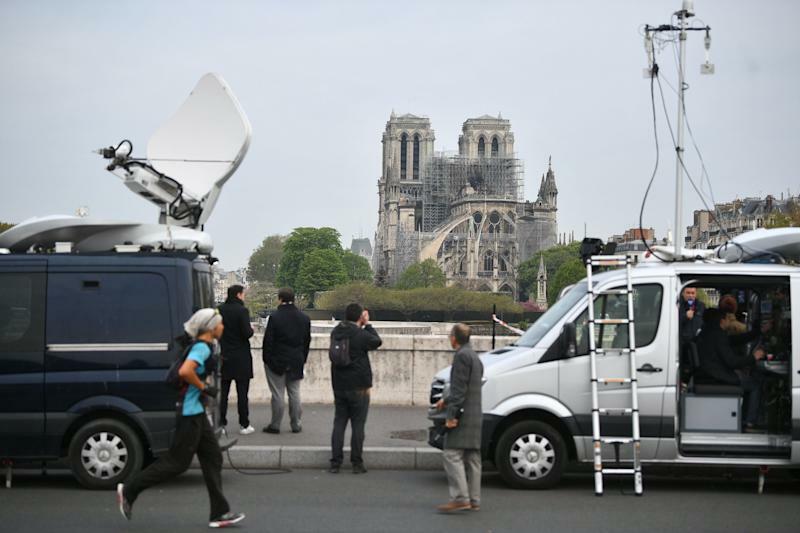 Media crews by the Notre Dame Cathedral in Paris following a fire which destroyed much of the building on Monday evening. It was reported that billionaire French fashion mogul Francois-Henri Pinault had pledged 100 million euros (£86 million) towards the effort. 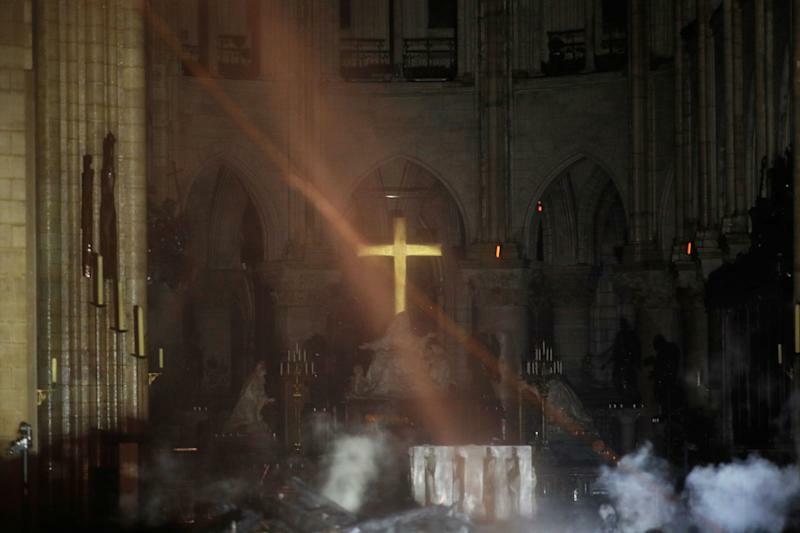 One powerful image released this morning showed the imposing crucifix above the altar still intact. 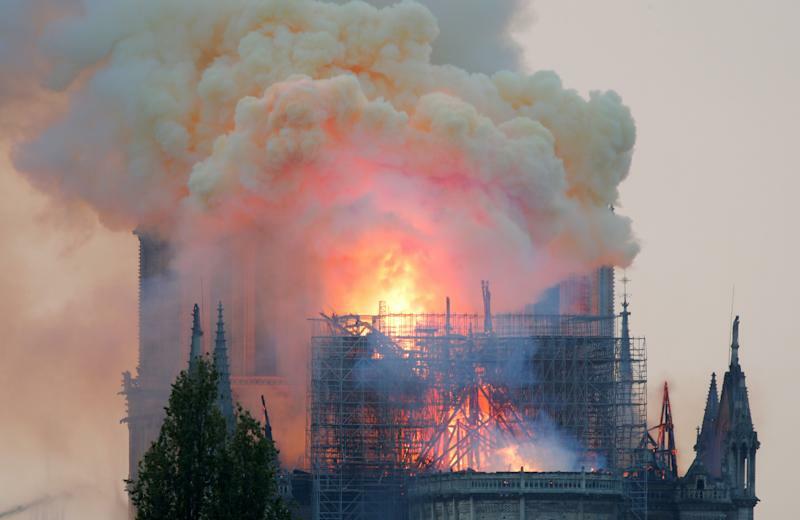 Notre Dame fire: How the blaze spread. 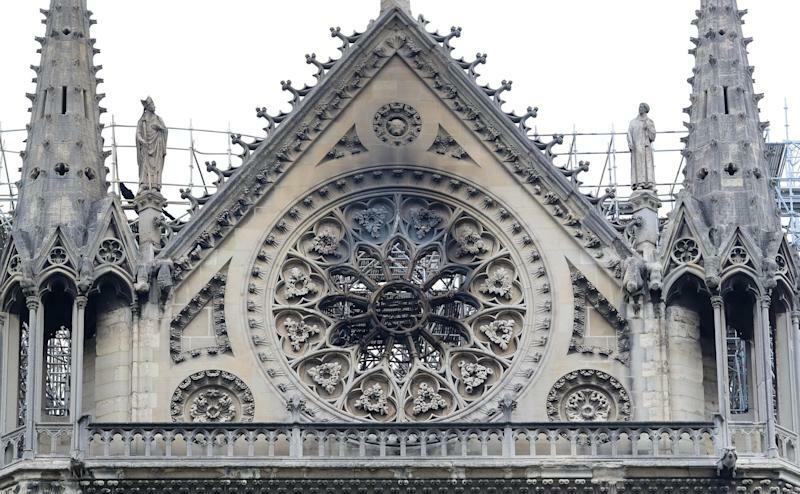 Both the bell towers were saved and they were also hopes the stain-glassed windows had survived the fire. 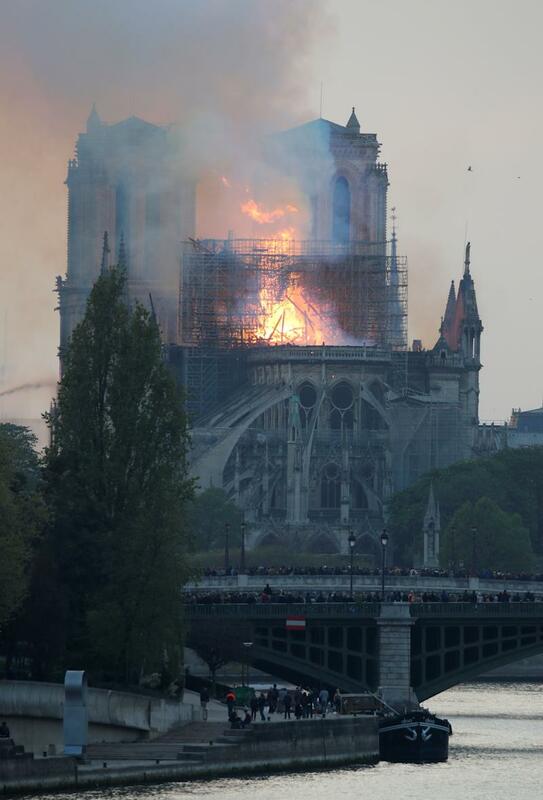 But as the blaze ravaged the historic cathedral in the space of an hour, the historic spire and tower were destroyed. 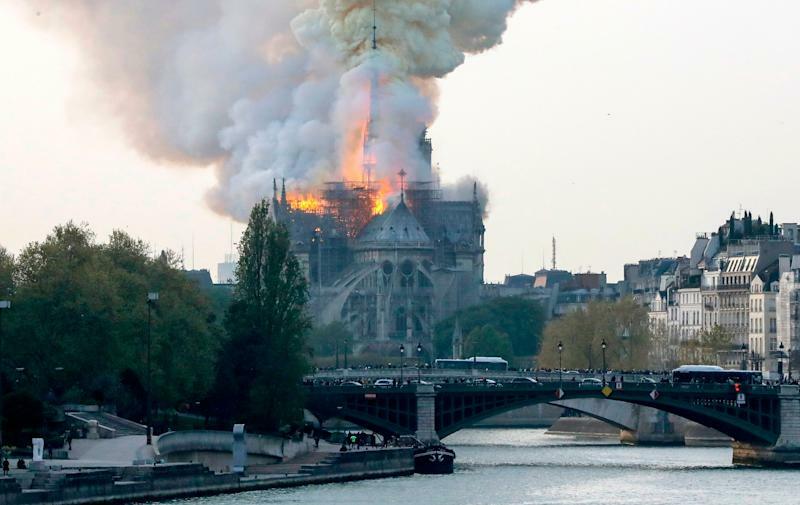 Emergency services were trying to salvage the art and other priceless pieces stored inside. One fireman has been seriously injured fighting the flames. 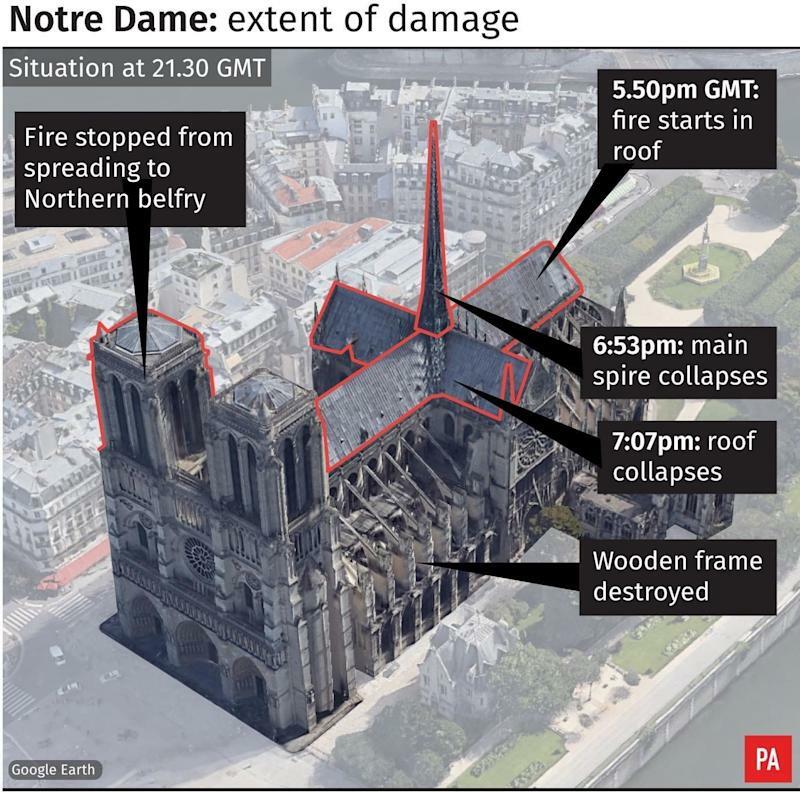 A cathedral spokesman said the entire wooden interior was likely to be destroyed. 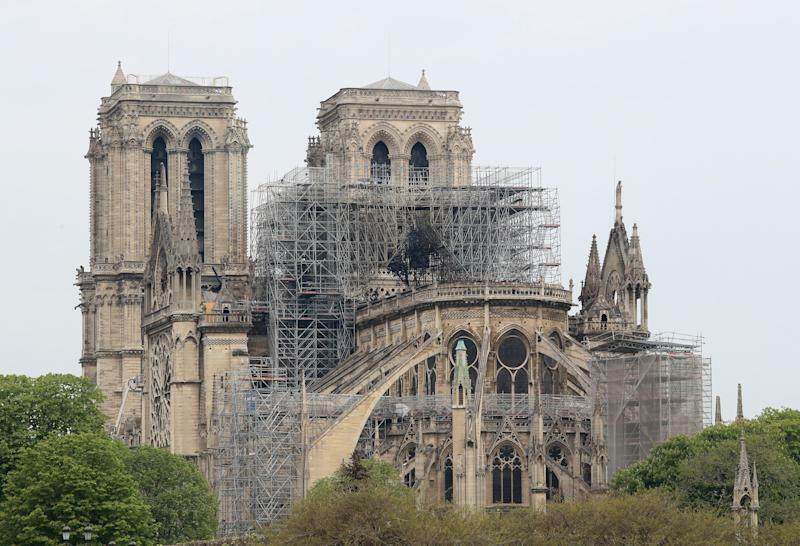 Officials said the fire may be linked to renovation work at one of the world's most famous tourist attractions. At present there are no reported casualties. 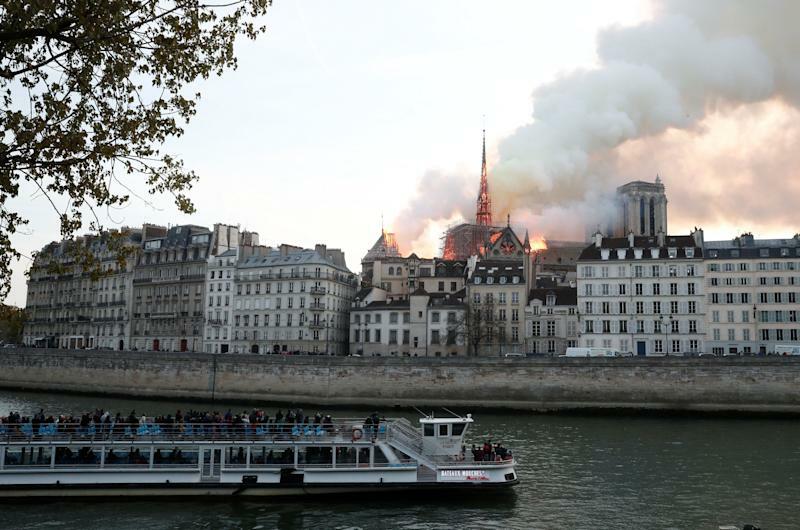 Thousands of people lined the streets of Paris as firefighters attempted to tackle the flames. Mr Trump suggested "perhaps flying water tankers" could be used to extinguish the fire. 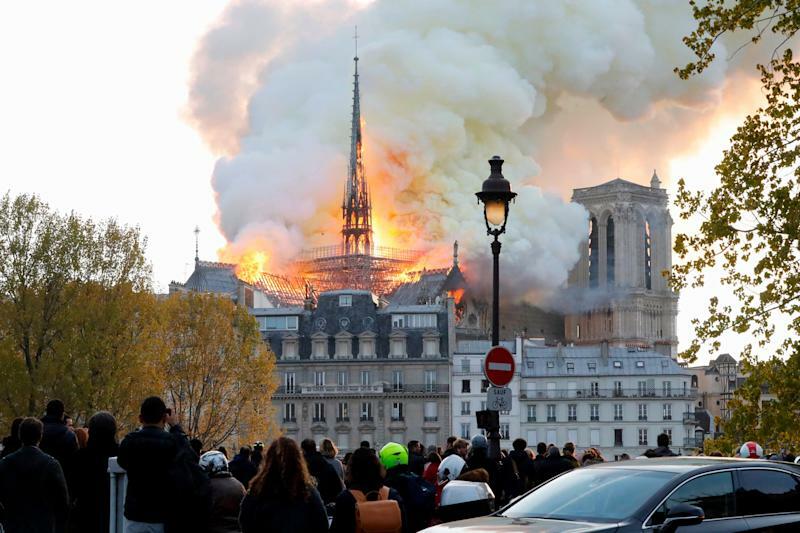 He tweeted: "So sad to see the images of the burning #NotreDameDeParis. 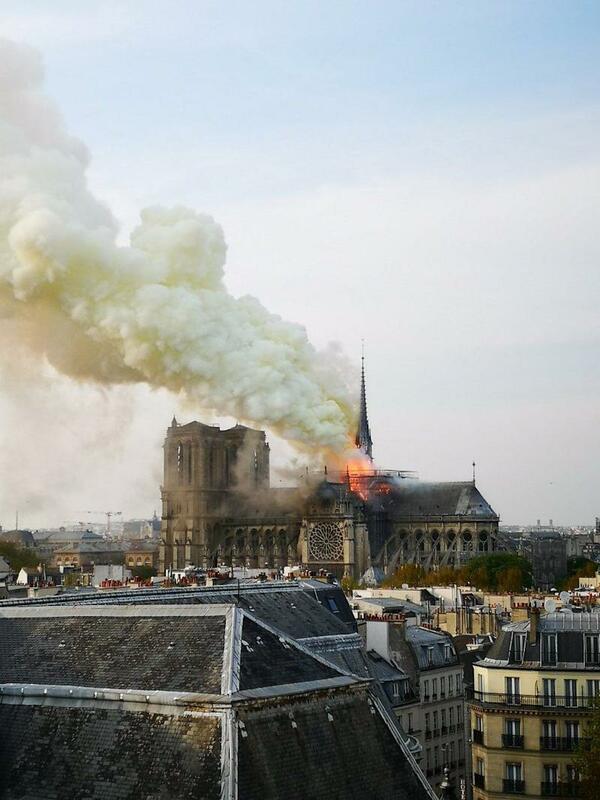 "I hope that the Paris fire brigade will get the fire under control as soon as possible. 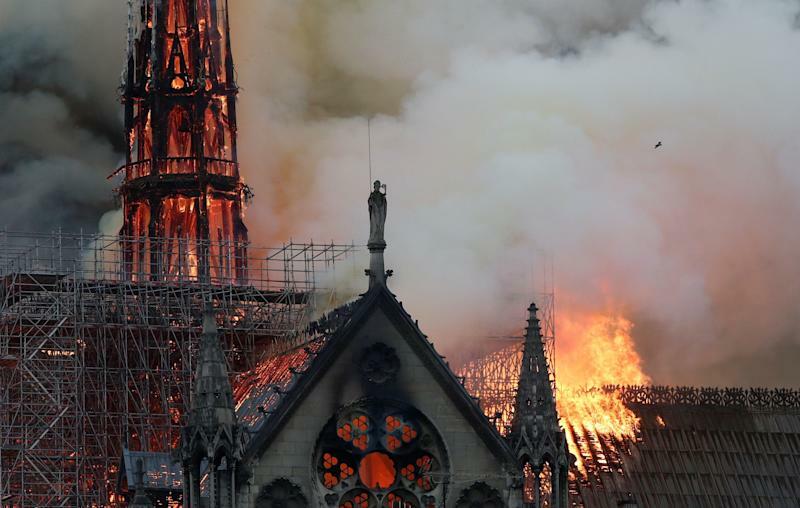 The building, one of the most recognisable churches in the world, is 850 years old and is considered one of the finest examples of French Gothic architecture. The cathedral receives around 12 million visitors each year, making it the most visited monument in Paris. It took around 200 years to build and was started under the reign of King Louis VII in 1160.